Acier Victoria has been working in the steel sector for 50 years. The company is constantly evolving and is working toward achieving very specific objectives: Maintaining a good business relationship with each client as well as continuously empowering and training their employees. Acier Victoria focuses on creating a business philosophy that encourages the establishment and upholding of our rigorous standards. Our 85,000 square foot heated warehouse accommodates more than 15,000 tons of ferrous and non-ferrous metals of all kinds. We have access to nearly 2,000 different steel, aluminum and stainless-steel products. Our customers’ usually very tight deadlines require speed and punctuality. That's why our 12 truck-fleet delivers most of our products as soon as possible upon receipt of orders. The success of Acier Victoria is based on experience and skills of its team working at different levels. Our customer base extends over the entire Quebec territory, more specifically within a 200-km radius of Victoriaville. We meet the demands of all customers: manufacturing companies, building contractors, and other contractors. We offer a complete distribution, cutting and delivery service. We guarantee you a professional, fast and personalized service. Computer-aided oxy fuel and plasma cutting table with 6 inch-thickness, 11-feet width and 50-feet length cutting capacity. Our team of experienced sales consultants will guide you in choosing the right materials for your needs. Acier Victoria has been distributing, cutting and delivering ferrous and non-ferrous metals in Quebec since 1969. 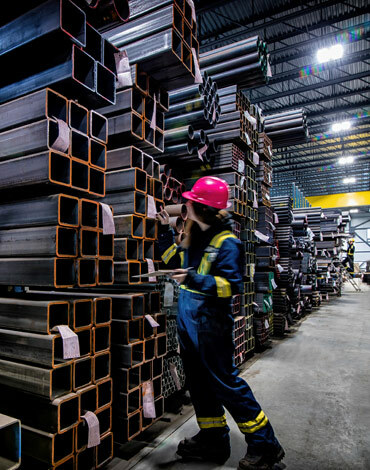 The company has stood out in the steel sector to become a leader in the province. © 2019 Acier Victoria. All rights reserved.